DIY Build A Katana Samurai Sword Set | BUDK.com - Knives & Swords At The Lowest Prices! Customize your very own samurai katana sword with our do-it-yourself, Build-A-Katana Samurai Sword Set. 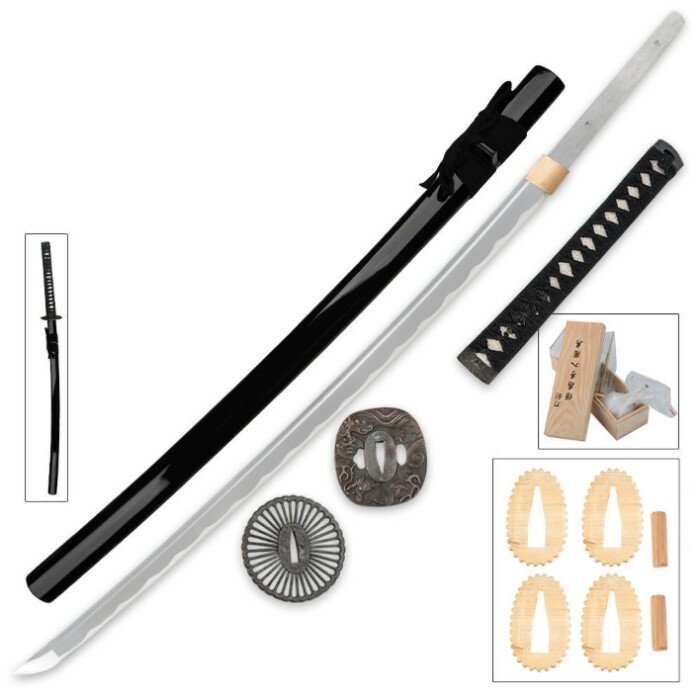 We've included everything you need to create your very own customizable samurai sword. You get a pre-sharpened 1045 high carbon steel full-tang blade, cord-wrapped ray skin handle and all the other fixings and embellishments to assemble your new handmade samurai treasure. A lacquered scabbard is included to house the blade. You can become a master sword maker in your own right with this one! I received this today and everything is good from the blade to the saya, to the tsuba. The only thing is, I was only given a pair of mekugi pins instead of two but I had some extras from my other swords. Fitting the sword into the saya after assembling the handle made the sword a tight fit in the saya and now I can't get it out but I guess that is good. Overall I am satisfied. Also this is a Tenryu sword. This sword does truly look and feel like a real samurai would weild. I should have read the description..... It does not come with the Dragon Tsuba. The Wood pins are too short for the sword. I had to go to Lowes to buy Oak dowels, and shape them on my belt sander to fit. Out side of that, everything is good. Response: Thank you for pointing that out, we have updated the picture. The blade is good quality and the fact that you build it yourself adds a sense of personal connection to the katana. Few test cuts on some bottles and wood and the blade has held it's edge. Needs a bit of sharpening. This was an amazing buy! This is my first katana purchase and I'm impressed with the craftsmanship on the blade as well as the tsuba.I did some filling to put the tang into the guard but otherwise it went well. I do have one complaint though. I asked to have the tang engraved but neither portion of the tang had my initials. Other than that though, everything about this blade is quite nice and it has the added bonus of teaching new collectors such as myself how to properly assemble and disassemble a katana. I originally ordered this sword at the beginning of January 2015. When it came, it was missing a Tsuba, 4 Mekugi, 2 Seppa and the wooden display stand. According to the website, there should be 3 Tsuba (I received 2), 2 Mekugi plus 4 extra (I received 2), 2 Seppa plus 4 extra (I received 4) and a wooden display stand (I received 0 (none)). I asked for an exchange. A month later my replacement sword arrived and guess what. It's missing the same identical pieces. I called customer service and they put a note on my account to check my next replacement to make sure that everything is in the package. It's going to take yet another month to get my sword. If it comes missing pieces again, I'll return it for a refund, find another place to make my purchases and file a complaint with the Federal Trade Commission and the Better Business Bureau. I don't see how they keep customers with this type of thing happening. I think I'll be looking elsewhere for my swords in the future. Yeah, the prices here are great, but I'm paying for something and not getting it. Response: Thank you for pointing out these errors; we have addressed them, and we are very sorry for the inconvenience this caused you. This product is solid. It is well crafted and beautiful. I have been collecting swords and knives for years and this is perfect for any collection. This was my first Real Sharp Katana i played enough with the Chinese imitations to know most dos and don't s and from the moment i opened the box i knew I would be getting more Katanas from True Swords. The Quality of craftsmanship in this whole product is nearly perfect, i had my Katana fully assembled in less than 10 minutes it was so much fun i honestly wanted to take it apart and do it again. the Sheath was the only piece in this set that i actually had to do a bit of filing sense the sword wouldn't go all the way in. About 10 minutes worth with a kitchen knife and it was all good! Nice quality craftsmanship for all individual parts. Mine needed a bit filing but overall a very nice kit for the price. The instuction was rather poor but just you tube it and you will be fine. Shipping time was unbelievable, although it wasnt free, it was here in less than 26 hours from the moment I bought it. Great product. 120 dollar sword + 15 dollar maint. kit + 5 dollar sword stand + 5 dollar cloth bag, plus some added extras that would equal 10-20 dollars or more. Definetly a great value.